1 100 kilometers of water supply network. 1 000 kilometers of wastewater drainage network and 400 kilometers of urban drainage network. Over 6 million cubic meters of clean water supplied annually. Over 9 million cubic meters of wastewater purified annually. 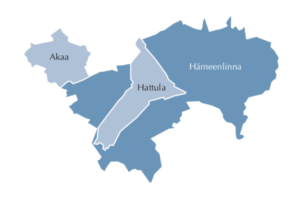 HS-Vesi is a limited company serving citizens of Akaa, Hattula and Hämeenlinna. The company is owned by its partner municipalities. HS-Vesi is responsible for the supply, treatment and distribution of clean, good quality water, and also collection of wastewater and efficient purification. The company is financing all its operations by collecting water and wastewater fees from properties, and works without any financial gain. The company maintains good condition and water resistance of pipelines and treatment plants. The company cleans and recycles used water back to nature with professionalism and reliability. Like the majority of our web pages, also our localized SMS Alert System works unfortunately only in Finnish, but you can view locations of temporary disturbances in water distribution on our ALERT MAP. If you have any feedback about the website or our services, please use this form. If you have any questions about our operations, water quality or water distribution issues, please send an email to hsvesi@hsvesi.fi or contact our customer service: 03 621 2279, Mon -Fri 8 -15. All personnel contact information can be found here.